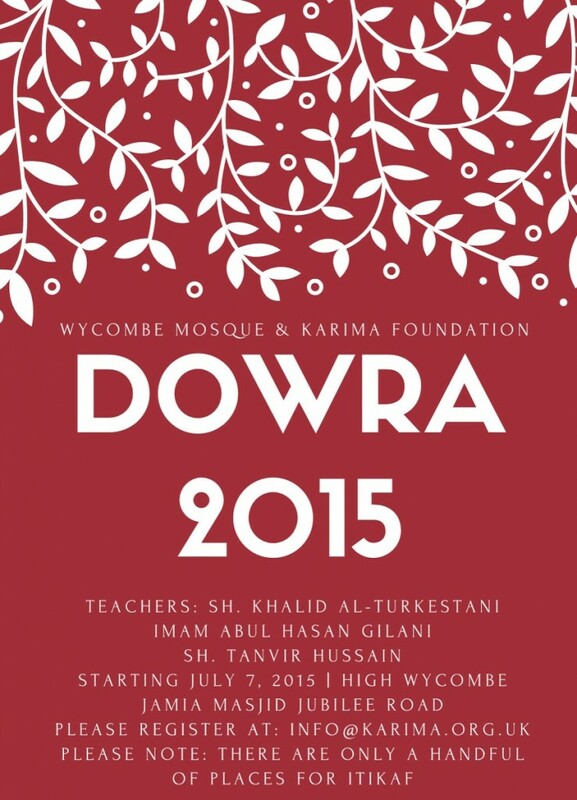 We are pleased to announce a FREE Ramadan Dowra taking place inshAllah during the blessed last ten days of Ramadan at the Jamia Masjid in High Wycombe. We will be mailing out further details and information to those registered soon. We will also endeavour to broadcast a live audio feed of the various lessons. Shaykh Khalid al-Turkestani is a Meccan scholar of hadith who was born and raised in Mecca. His ancestors migrated to the Holy City from Kyrzygstan after the country fell to the communist Soviet Union. He is a student of the great Shaykh Muhammad Yasin al-Fadani, Sayyid Muhammad Alawi al-Maliki, Sayyid Ahmad al-Ruqaymi and numerous others. He is a graduate in Islamic Studies from the Umm al-Qura University and has been working as a primary school teacher in Mecca for many years. In addition to his full time job he is actively involved in the preservation of the remnants of the traditional scholarly heritage of Mecca and teaches Sahih al-Bukhari to students who reside in the home of the late Sayyid Abbas al-Maliki (Allah have mercy on him). 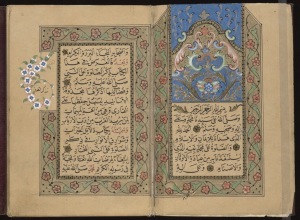 In the course of some research on the relationship of the scholars of Najd who followed Shaykh Ibn Abd al-Wahab and their shocking takfir of the Ottoman Empire I came across the mention of the contents of a letter authored by the Ottoman Sultan Selim (III) [d. 1223 Hijri] addressed to the Prophet (Allah bless him and give him peace). The letter was found in the Hujurah Sharifah (which I believe is the area behind the golden gates and between the blessed grave) by the followers of the Scholars of Najd movement and was disturbingly regarded as a proof of the Sultan’s disbelief. He wrote a significant amount which this is the summary of its meaning. 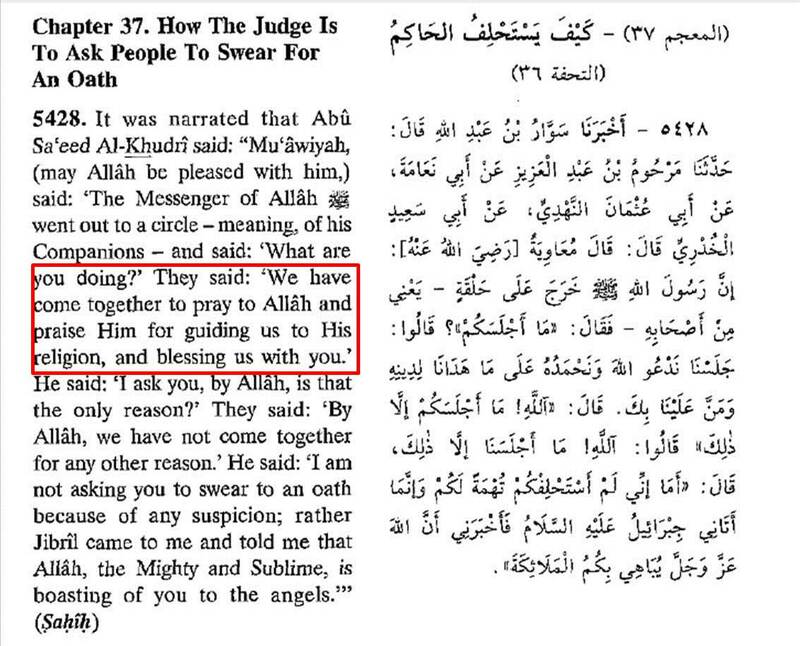 So look at this great shirk and disbelief in Allah the One and All Knowing. Please find below a link to the poem entitled Iqd al-Thamin in praise of the Prophet (Allah bless him and give him peace) authored by Shaykh Abu Bakr al-Mulla from al-Ahsa in present day Saudi Arabia. The poem appears to be on the same meter as the famous Qasida al-Burda (i.e. the same tunes used for the Burda can also be used for this poem) and consists of words of: praise of Allah (Most High); lofty attributes and qualities of the Prophet (Allah bless him and give him peace) and supplication. We received this poem from a scholarly descendant of the author in a gathering the month of Rabi al-Awwal a couple of years ago. He in turn had received it from the scholars of his family going back to the author himself. The audio recording is of a small group of Saudi Munshids reciting the poem and may be useful to those who would like to review the wording of the poem. 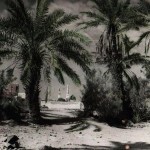 On this site I have previously uploaded a biography of Shaykh Abd al-Baqi al-Ayyubi, originally from Lucknow (India) who settled in Madinah the Illuminated and became one of the prominent ulema of his era in the Hijaz. When discussing him with Shaykh Yahya al-Mulla, I was informed that Shaykh Yahya’s father would during his holidays from the Sawlatiyyah school in Makka travel to Madinah al-Munawwarah and study with Shaykh Abd al-Baqi. He added that his father had a good relationship with the Shaykh and that he has in his possession documents signed by Shaykh Abd al-Baqi which belong to his father. Shaykh Abd al-Baqi is perhaps best known for his work on Musalsal hadith narrations entitled Manahil al-Salsalah, which is regarded to be the most comprehensive work on this topic (though not exhaustive). In the course of Shaykh Abd al-Baqi’s relating the various types of Musalsal handshakes he related the following incident which he narrates via the scholars of his home city Lucknow. The incident took place with the notable Indian scholar widely known in scholarly circles by his title Bahr al-Ulum (d.1810), who authored a number of works in the Islamic sciences, and whose relating of the following incident should be taken seriously, as it is from a pious scholar respected for his mastery of the Islamic sciences. We narrate the handshake of allegiance by means of the aforementioned chain, the story of which we narrate from our Shaykh who related it in Umdat al-Wasail hearing it from Malawi Abd al-Rab bin Bahr al-Ulum who heard it from Mulla Ala al-Din who has been mentioned earlier. The story is that Bahr al-Ulum was one night researching in a book as was his practice in the upper level of the house, this was whilst his students were sitting on the ground level of the house. An Arab Shaykh came and went to him upstairs and greeted him with Salam. Bahr replied to his greeting and went back to his important research. The Shaykh said: Will you not honour your guest? At this he [Bahr al-Ulum] closed his book and turned his attention towards him. The Shaykh said: Come with me, a great person is calling you. Bahr al-Ulum thus accompanied him until he came upon a rider upon a horse below a tree with his face covered. The rider said to him: Do you know that the Shaytan cannot impersonate your Prophet (Allah bless him and give him peace)? The rider then said: Do you know the physical description of your Prophet (Allah bless him and give him peace)? At this point the rider unveiled his blessed face and said: I am your Prophet and this is Abu Bakr al-Siddiq. A cloth was then spread out for him and Bahr al-Ulum was ordered to take allegiance, and he took allegiance with the Prophet (Allah bless him and give him peace) by means of a handshake, and this was in the city of Rampur. 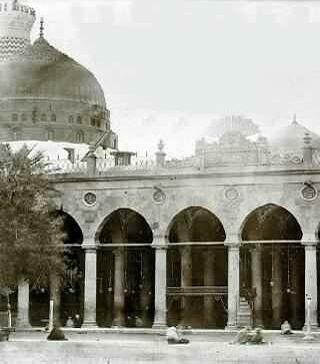 The Arab Shaykh was seen by Bahr al-Ulum’s students including the previously mentioned Ala, and [later] Bahr informed them of what took place. The form of the handshake which we took is the joining of one hand with the other and thumb with the other. Note 1: For those who may have questions about the possibility of meeting the Messenger of Allah (Allah bless him and give him peace) in a waking state, Imam al-Suyuti and others have authored works where they argue such an occurrence is possible. Note 2: InshAllah, with the tawfiq of Allah Taala a project that has been discussed is to prepare a new edition of the Manahil al-Salsalah based on the copies of the students of the students of Shaykh Abd al-Baqi. Once again the month of Rabi al-Awwal has witnessed the launch of campaigns to stop people attending gatherings known as “Mawlid”. What I have found disturbing is the dissemination of misleading information on the issue from individuals who do not appear to be able to look calmly at the issue, but rather blindly copy and paste articles against the Mawlid without verifying the accuracy of what they are spreading. 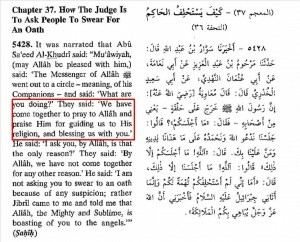 The above hadith (from Sunan al-Nasai) is one of the clearest evidences for the permissibility of the Mawlid, and clearly shows the companions gathering together to thank Allah (Most High) and give thanks for blessing them with the Prophet (Allah bless him and give him peace). Are the Mawlid gatherings not what is being described in the hadith? I have more to say on this topic but do not have the time at the moment, however I will suffice with the following points as summaries of more detailed discussions. 1. Definition of Mawlid gatherings: It is not a birthday gathering as in the conventional western sense, but a gathering mentioning the sirah of the Messenger of Allah (Allah bless him and give him peace) which without saying would include a mention of the blessed birth. These gatherings usually include recitation of the Quran and singing of Qasaid, the vast majority of them being held throughout history until today without any haram actions intermixed. 3. Two Approaches: Muslim scholars took two approaches to argue for Mawlid gatherings being permitted/recommended. First: Mawlid gatherings existed at the time of the salaf but were not known by this name (refer to the Fatwa of Shaykh Abd al-Hayy al-Luknawi and the hadith above). Second: Mawlid gatherings in this exact form did not exist at the time of the salaf but their basis is present in the Shariah which has given scope for them to take place, thus they cannot be considered as a bad innovation. (This is the approach of Hafiz Ibn Hajar and Imam al-Suyuti). 4. All in a name: If the name of Mawlid gatherings was changed to “Sirah Lesson” where some qasaid are also sung how many people would find it problematic? Indeed if you were to invite them to such an event they would probably not even notice they were actually attending a Mawlid. This is the approach I have seen being taken in Madinah al-Munawwarah where outside the place of a well known weekly Mawlid a sign reads ‘Majlis al-Sirah al-Nabawiyyah’. 5. Mawlid everyday: Mawlids are held outside of Rabi al-Awwal and some scholars of the past are said to have held them everyday in the evening in their homes. As with other lessons Mawlid gatherings are perhaps held once a week due to peoples time commitments and inability to attend everyday. Thus to argue that they only take place in Rabi al-Awwal is incorrect and misleading. 6. Ignorance: Cutting and pasting long articles on bidah and just repeating the flawed argument “Did the Prophet (Allah bless him and give him peace) hold Mawlid gatherings” betrays an ignorance of what the sunnah is. Our question to such people is: Do you regard the words and tacit approval of the Prophet (Allah bless him and give him peace) as constituing the sunnah? if so why have you mentioned only actions? If you do agree with us with the prophetic words and tacit approval being from sunnah then how can you claim that organising gatherings where the sirah and qasaid are read is not sanctioned from the sunnah? Note: The scan of hadith at the top of the post was highlighted by Shaykh Abdullah al-Hussaini al-Hashimi from Makkah in his work on the Mawlid, may Allah (Most High) reward him abundantly. O Allah, send your blessings and peace on the light which manifested in this month. All praise is for Allāh, Lord of the Worlds; blessings and peace be upon the Master of the Messengers, his family, companions and all those that follow them with goodness. He is the Imam, most learned scholar, hadith expert and jurist: Abu Muhammad Shihab al-Din Ahmad bin Muhammad bin Ahmad bin Ali well known as al-Nakhli, the Sufi, al-Naqshbandi al-Makki al-Shafi. He was born in the year 1044 Hijri in Makka al-Mukarrama and grew up there. He narrated from: Muhammad bin Yahya al-Radini, Abdullah bin Saeed Ba Qushayr al-Makki, Sayyid Ahmad al-Hasani al-Maghribi al-Meknasi, Muhammad Ala al-Din al-Babili and others. He distinguished himself the Islamic sciences and taught and benefitted people in the Masjid al-Haram. He was described as being cheerful, humble and possessing an illuminated face. Countless students narrated and benefitted from him, amongst them: Abu Tahir al-Kawrani, Abd al-Rahman bin Ahmad al-Nakhli, Shihab Ahmad al-Malwi and others. From his works are: Bughyah al-Talibin li Bayan al-Mashaikh al-Muhaqqiqin al-Mu’tamidin which was published in the past in India. He passed away in Makka al-Mukarrama at the beginning of the year 1130 Hijri. “He was an expert in both the outer and inward sciences and benefitted from the regular company of Shaykhs of sufi orders and scholars of the sacred law. He obtained the cloak of authorisation from Sayyid Abd al-Rahman Mahbub, Sayyid Ahmad Rumi, Sayyid Abdullah Saqqaf and Mir Kalan bin Mir Mahmud Balkhi and others. He studied hadith with Muhammad bin al-Ala’ Babili, Shaykh Isa Maghribi and other scholars from that generation, and from them he obtained the unbroken transmission for the hearing of Bukhari and the Muwatta. He was associated with the families of a number of scholars and from the beginning he was attracted to a love of knowledge and scholars and keeping their company. He held the Sufis in high regard and was consistent in their spiritual practices, and benefited from the company of the scholars from the Haramain and those from outside it. To sum up, it is that Shaykh Ahmad Nakhli was from the great figures of Makka Muazzama the light of whose blessedness was widespread and whose supplication was answered. Shaykh Ahmad Nakhli’s son Shaykh Abd al-Rahman Nahkli recounts that his grandfather would not have any male children who remained alive, due to which he would remain extremely distressed. When Shaykh Ahmad was born a supplication for him was requested from the awliyah as well as their help and spiritual attention. Every Friday he would send Shaykh Ahmad Nakhli to Shaykh Taj Sunbhuli. One day by it so happened that Shaykh Taj Sunbhuli after a period of reflection conveyed him a message by means of the servant who brought Shaykh Ahmad Nakhli to him that, “This child is not like you, rather he will excel you and be a person of virtue and felicity. It is a separate matter that he is of a small lifespan.” When the servant reached his master and conveyed to him the message of Shaykh Taj Sunbhuli he sent him back immediately to request from Shaykh Taj Sunbhuli that “I have given my lifespan to this child and in relation to this I seek your intercession.” When Hadrat Shaykh [Taj Subhuli] heard this message he immediately focused and after a few moments said to the servant that “Tell your master that his request is completed, and from myself I give him (meaning the father of Shaykh Ahmad Nakhli) a staying period of three months to prepare for his journey to the afterlife.” As a result Shaykh Ahmad Nakhli’s father departed from this perishing world at this time and Shaykh Ahmad Nahkli reached 90 years of age. Shaykh Abd al-Rahman further stated that in all worldly dealings and lending and borrowing I was my father’s agent. When my respected father (Shaykh Ahmad Nakhli) reached the end of his life and weakness had overcome him I presented to him the complaints of those who requested the repayment of their loans. I stated that “I fear that if God forbid if you were to pass away then all of these debts will become my responsibility and those close to me and relatives will not reply upon my being an agent.” My respected father told me that “Do not give this fear any place in your heart. I have full faith that I will not die until I have repaid all debts which I owe. I think that that night will be the last night of my life in which nobodies debt will remain on me.” A short period before his passing away all of these debts were repaid with money coming from places which could not have been expected. And according to what he said his last night in this world arrived when he had no debt left to repay. Many of you will be aware that the small building known as the Maktabah Makkah al-Mukarramah is regarded as being the location of the birth of the best of all creation, the Messenger of Allah (Allah bless him and give him peace). On a trip to the Hijaz last year I was honoured to meet a great Makkan scholar who I was previously unaware of, namely Dr Abd al-Wahab Ibrahim Abu Sulayman. Dr Abd al-Wahab is I am guessing is in his mid to late 70’s and was a student of the great Shaykh Hasan al-Mashat. He also happens to be a member of the committe of senior Saudi scholars and thus holds an important position in scholarly circles. During my visit to his home I was fortunate enough to hear him discuss a number of issues relating to Maliki fiqh and his research on the birthplace of the Prophet (Allah bless him and give him peace) which he mentioned was established accurately without room for any doubt. I thought it may be of benefit to present a summary for English speaking Muslims of Dr Abd al-Wahab’s article on the authenticity of the location of the library . The article was written in an academic fashion and an attempt has been made to present the main findings and evidences in an easy to follow manner. There has been much discussion surrounding the location of the Maktabah Makka al-Mukarramah and whether this is the location where the Prophet (Allah bless him and give him peace) was born. Those who have not studied history have spoken on this issue without researching the matter, what follows is a presentation of historical evidences which prove beyond doubt that the knowledge of the precise location of the Prophetic birthplace was recorded and passed down accurately. It is not difficult to know the place of birth of the noble individuals of a society. From the agreed upon matters in Islamic history is that the family of the Messenger of Allah (Allah bless him and give him peace) were from the noblest of Qurayshi families and highest of them in rank. Their place of residence in Makka was in the Shiab Bani Hashim which is a well known area in previous and in recent times. Bani Hashim, the family of the Messenger of Allah (Allah bless him and give him peace) held a position of leadership in the tribe of Quraysh, their children were of special importance, at their head being Muhammad bin Abdullah the Messenger of Allah (Allah bless him and give him peace). 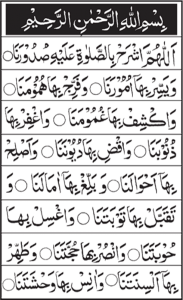 His (Allah bless him and give him peace) famly was their most noblest and greatest in rank and therefore were well known. It follows that the birth of al-Mustafa (Allah bless him and give him peace) which was the divine choice for the seal of messengership was a well known matter; whereas the birthplace of ordinary people who have no importance in society can be unknown. There is not the least doubt in the minds of knowledgeable intelligent people and uneducated ordinary people regarding the location of the birthplace of the Messenger of Allah (Allah bless him and give him peace). For this information is mass transmitted (tawatur) certain knowledge which has been established from records. We begin this study with some examples – on the basis of citing as evidences and not as an exhaustive list- from the writings of authors in different fields and different sciences who paid attention in detailing/specifying the place in which al-Mustafa (Allah bless him and give him peace) was born in Makkah al-Mukarramah. The later books of Prophetic biography relate that which the early companions and tabieen recorded in their works, thus it is the narration of trustworthy narrators from trustworthy narrators from trustworthy narrators. The authenticity of these statement is understood by all those who have any experience relating to Islamic heritage, more specifically the collections of the blessed prophetic hadith. Books along, their authors information and relevant quote is presented. Note: Some authors (as is known to those familiar with Islamic works) will first cite the strongest view and then follow it with the weaker opinions on the matter with the phrase ‘it is said’. This practice presents the strongest view to the reader and help identify any weak opinions which might have been mentioned in the past. Note: He first mentioned regarding the birth of the Messenger (Allah bless him and give him peace) the strongest view as is the practice of authors and then mentioned the weaker opinion which he prefaced with “it is said”. This is to denote that it is a weak opinion and not relied upon. He (1/408) mentioned the strongest opinion which the majority of scholars adhere to which has been mentioned above, after which he cited the weaker opinions on this issue which are not relied upon. “Mawlid al-Nabi (Allah bless him and give him peace)-meaning-the house in which the Prophet (Allah bless him, his family and give him peace) was born. It is in the home of Muhammad bin Yusuf the brother of al-Hajjaj bin Yusuf. Aqil bin Abi Talib took it when the Prophet (Allah bless him and give him peace) migrated. Regarding this and other homes the Messenger of Allah (Allah bless him and give him peace) said in the year of the farewell pilgrimage ‘Has Aqil left us a place of shade?’ this was when he was asked, ‘Where should we stay O Messenger of Allah?’. Abu Walid narrated to us, he said: I heard my grandfather and Yusuf bin Muhammad affirming the matter regarding the Mawlid, and that it is that house. There is no difference over this amongst the people of Makka. Note: Allamah al-Fasi mentioned the weaker opinions regarding the place of the blessed mawlid and highlighted they are weak opinions. “Chapter Three: Regarding the well known places in it (Makkah al-Mukarramah) and Masajid”. He dedicated his third chapter (p.102-108) to the historical places in Makkah counting 31 places including mention of locations linked to the companions (Allah be pleased with them all). He included all that was mentioned by the earlier scholars, sifting through authentic and weak opinions and indentifying them as such. There is no doubt that these trustworthy authors words carry weight, as the majority of them were from the specialists of hadith (Muhaddithin), jurists (Fuqaha), judges and people of knowledge from Makkah al-Mukarramah who had lived there since their childhood (if they were Makkan born), or its scholars who had taken up permanent residence. Their words regarding the location of the birthplace of the Prophet (Allah bless him and give him peace) is reliable transmitted information by which certain knowledge is established (tawatur al-ilmi) in its most clear and manifest form. There is no need for additional quotes and references, as those who require further references can refer specifically to the books of Hajj rites authored by the Makkan scholars. It is known that the passing down of information from generation to generation is a method of the establishment of facts according to the scholars, and as highlighted by Ibn al-Qayyim in his work Ialam al-Muwaqqien (2/273). A large group of people from the later generation transmit from the previous generation consisting of the sons and residents of Makkah regarding the specification of the locations which has been transmitted & established. They are well known to the people of Makkah and well known between their scholars and common people. Most of them were standing and observable before the expansion of the Haram al-Sharif in the year 1375H and the following expansions. The specification and confirmation of the location have been cited in this article from the statements of the previous scholars. A recent affirmation of the location of the Prophetic birthplace is the ruling of the High Shariah Court of Makkah al-Mukarramah regarding this blessed place is deed number 140 in the fourth volume dated Jamadi al-Akhirah 1373H/1 February 1954. 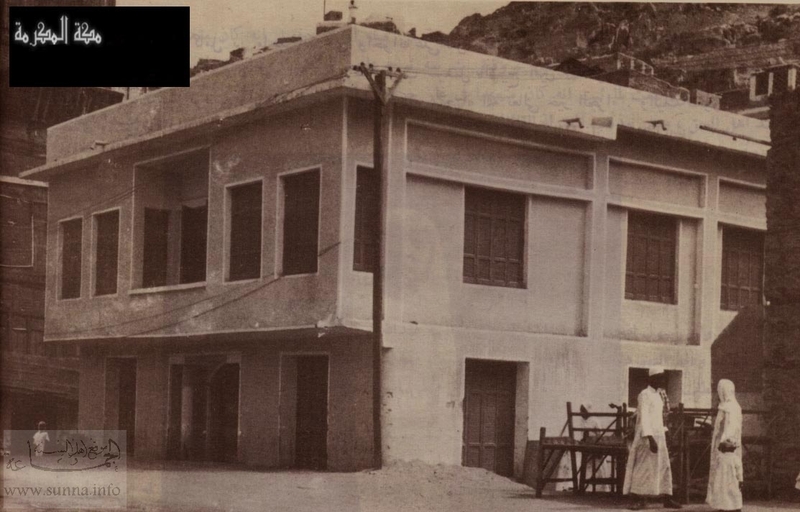 The deed was affirmed by the head of the Shariah High Court of the time Shaykh Abdullah bin Umar bin Duhaysh for the building of the library which stands on this place today. It should be noted that no witnesses needed to be called either for this legal document due to the common knowledge of the location of the Prophetic birth. Second: His Majesty King Abd al-Aziz (Allah have mercy on him) took the step of establishing a general library in this blessed place after consulting senior scholars over this. Thus it is established clearly through mass transmitted information that the current Maktabah Makkah al-Mukarramah in its current location is the place where the noblest of creation our Master Muhammad (Allah bless him and give him peace) was born. The term Sayyidi, or its shortened version ‘Sidi’ has now become a standardised term in the vocabulary of the ‘Traditonal Knowledge’ camp. A friend of mine who heard the term for the first time being used left right and centre at an event asked me, “Is Sidi used for those who are half way between being a common person and a scholar?.” I laughed at his analysis and told him it might be similar to the Indo-Pak usage of ‘Sahib’ for respect. Saeed bin Abi Saeed al-Maqbari relates that: “We were with Abu Hurayrah when Hasan bin Ali bin Abi Talib came, he gaves us the greeting of peace (salam) and we replied back to him with greetings of peace. Abu Hurayrah did not know who he was. This was narrated by al-Hakim who said that its chain was Sahih…and by al-Tabarani in al-Kabir and its narrators are trustworthy. “Our Shaykh, the Shaykh of the Sunnah, Imām al-ʿAllāmah, Shaykh Ḥasan al-ʿAdawī al-Misri in his marginalia on Bulūgh al-Musarrāt ʿala Dalā’il al-Khayrāt said, ‘It is sufficient honour for this book that it has attained in terms of benefit and acceptance that which the intellects find astonishing. How can it not be so when some of the gnostics have taken it directly from the Master of the Messengers (Allah bless him and give him peace). The Shaykh of our Shaykhs, and their Shaykh, Imām al-Sujāʿī said in his marginalia to this book, copying from his Shaykh the Quṭb and Ghawth, Imām Muḥammad al-Ḥifnī, ‘I have taken this book through the outward means from our Shaykh al-ʿAllāmah Muḥammad al-Budayrī al-Dimyāṭī, who took it from the Quṭb al-Ghawth Muḥammad bin Aḥmad al-Meknāsī to the end of the chain to the author. “In Kashf al-Ẓunūn an Asmā’’ al-Kutub wal-Funūn it is [mentioned], Dalā’il al-Khayrāt wa Shawāriq al-Anwār fi Dhikr al-Salāt ʿala al-Nabī al-Mukhtār upon him be blessings and peace. It’s beginning is, ‘All praise is due to Allāh who guided us to faith…to the end by the Shaykh Abī ʿAbdullah Muḥammad bin Sulaimān bin Abī Bakr al-Jazūlī al-Simlālī, al-Sharīf al-Ḥasanī who died in the year 875H.